Welcome back to day seven! We've had quite a few entry about raptors so far, so now we're going to switch things up and talk about one of my favorite kinds of birds: corvids. Today's entrant is Stacey Wittig of the Vagabond Lulu blog, who helpfully included a bio! Stacey is a freelance writer based in Flagstaff, AZ. Her culinary adventures have led her up the Inca Trail in Peru eating fried caterpillars and roasted guinea pig, across the plains of northern Spain on El Camino de Santiago enjoying tapas and steamed barnacles, and through the vineyards of Cinque Terre sipping Chianti Classic. “Northern Arizona is a remarkable place to call home,” declares the wandering writer who loves sour cream enchiladas at El Charro Restaurant in Flagstaff, AZ. What is the Difference between Ravens and Crows? 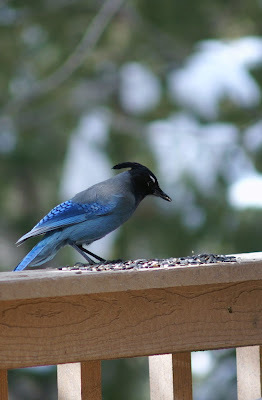 Flagstaff, AZ--Today I saw a crow at my bird feeder for the first time. It's not that a crow has never been there before. I just never recognized it as a crow; I always thought that it was a raven. That was until I attended Shannon Benjamin's presentation Corvid Lore: Ravens and Crows in the American Southwest at the Riordan Mansion State Historic Park in Flagstaff, AZ. Raised in Minnesota, I surely know what a crow looks like. When I moved "Out West" I became acquainted with ravens. For some reason, somewhere during my own southern migration, I came to believe that crows live near the corn fields of the Midwest, and ravens were the black birds of the western skies. Back to my feeder. I knew that the big, glossy black birds with thick beaks bounding around my feeder were ravens. I just hadn't been discerning enough to notice that some of those cackling black birds had smaller, pointed beaks. Some of my Flagstaff ravens were actually crows. So much for bird watching. At the lecture, Shannon quickly put to bed my notion that crows live only in the bread basket of this fair nation. Further, she explained that crows and ravens fraternize. 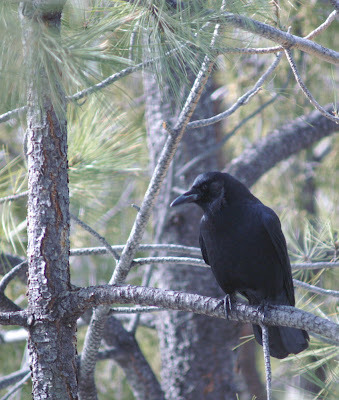 "Crows and ravens socialize, especially when it comes to food," Benjamin explained, pointing to a slide of ravens and crows together at a typical Flagstaff bird-sighting location: a dumpster in front of Ponderosa Pine trees. "Crows' tails are blunt, while Raven's tails are pointed, or diamond shaped," she continued. Another slide, this time raven from the backside, ala pointed tail. Crow with straight tail feathers and narrow, long beak. Is that bird flapping or soaring? The flappers are crows. Ravens soar in a fashion much like hawks or eagles. That's probably why I must take a second look at ravens flying against the sun, when I am trying to spot Red-tailed Hawks on my way home from town. Want one more definitive difference between crows and ravens? Ravens are larger and have shaggy throat feathers. Perhaps that's why the raven's cry sometimes sounds more like a croaky frog. Shannon explained that ravens and crows are part of the Corvid family. Corvids are known for their high intelligence. In fact, their brain-weight-to-body-weight ration is that of a chimpanzee. Corvids are clever problem solvers who learn and modify their behavior accordingly. Even so, Corvids mate for life. Corvids are curious and collect and cache shiny objects. Perhaps their similarity to our own human behavior causes us to relate to ravens and crows. Ever feel ravenous? Have you complained about "crow's feet" at the lid of your eye? Measured distance "as the crow flies?" Corvid family, and a regular at my feeder. Many Native American cultures have noticed the Corvid's s resemblance to humans. The Hopi believe that Crow Mother is the creator mother of all Hopi spirits. Zuni storytellers like to explain "How the Black Bird Taught Coyote to Dance." One tribe of the Sioux calls themselves the "Crow." And now I am "eating crow" as I look at my feeder and watch as those human-like black birds, that I thought were ravens, become two distinct species. Thanks for the great entry, Stacey! We'll be back tomorrow with another entry in the Swarovski Optik Guest Blogging Contest!